Soil is the most important part of any traditional garden yet it is the element which is most often overlooked. If you compare the components of a building to those of a garden then the soil represents the foundations which everything else is built on and relies upon. Would you build a house and not put adequate foundations in ? Of course not. So why create and maintain a garden without any thought for the soil ? 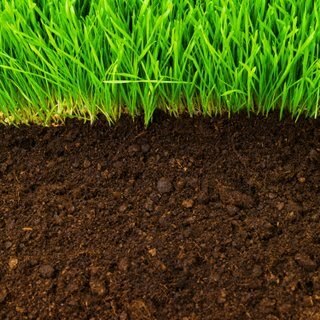 Soil is a living entity which just like you and me requires certain conditions to be met in order to be healthy. If you have healthy soil then anything you plant in it is extremely likely to also be healthy and attractive. If you have ever thought that your garden plants are not growing as they should there is a very good chance that the soil is the problem. It could be a number of other things such as pests, diseases, wrong plant for the situation or basic human error, but even some of these can be directly linked back to soil health. contains a network of spaces which allow roots to penetrate to a suitable depth and find water and nutrients without hindrance. Living organisms include such things as earthworms, anthropods, bacteria and fungi. Most of these play a very important part in the decomposition of dead organic matter, which explains the high population of earthworms usually found under manure and compost heaps. Humus is the slowly decomposing residues of organic matter after it has initially been worked upon by the living organisms. It is recognised as a black colloidal material which coats the soil particles giving topsoil its dark colour. Humus eventually disappears at is further broken down by bacteria. In the wild all of these minerals are taken up by the plant and returned to the soil when they die back and decompose on the ground. When we remove a plant or part of it the natural cycle is broken and so minerals are prevented from returning to the soil where they can be reused. In these circumstances the soil will progressively become less fertile to a point where we have to intervene with the application of fertiliser or organic matter. Now you know why lawns that have had the clippings removed year after year will need increasing amounts of fertiliser added to them in order to provide growth and attractiveness. Soil pH needs to be considered in conjunction with the nutrient levels present because soil pH greatly influences life in the soil, either directly or indirectly. The optimum pH for most soils is 6.5 at which all the essential nutrients are available and ideal growing conditions are provided for most plants. As soils become more acidic or alkaline certain nutrients become unavailable respectively leading to unhealthy plants. A good example of this is where Rhododendron are planted in alkaline soil. Iron is most available to plants between pH4.5 and pH6. Above this levels progressively fall and the plant suffers from chlorosis where the leaves yellow between the veins from lack of chlorophyll. As you can see soil health is influenced by many different factors and problems can arise from any of these either in isolation or in various combinations. There could be other things at work (that are not covered here) which have a detrimental affect on plant health such as pests, disease or parasitic disease causing fungi and bacteria. The next article deals with soil problems, why they occur and how to remedy them.